Engineer your career. Take control with IMI. 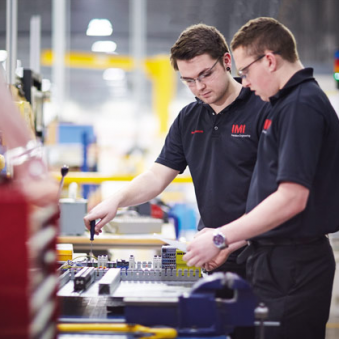 With a history of innovation spanning 150 years, IMI is a member of the FTSE 250 with operations in over 20 countries. We count some of the world’s biggest businesses as our customers and we engineer solutions for them that control the precise movement of fluids. You'll find our products inside everything from the machine that makes your morning coffee to power plants and oil rigs. Enjoy a uniquely diverse experience on one of our two-year Graduate Programmes. Undertake different rotations, work on live projects, take on real responsibility and experience the product lifecycle end-to-end. All of which will help you build your long-term engineering career with us. Your journey with IMI will typically start and end in your home country, but you’ll also get to experience at least one placement outside the country. The countries where our programmes currently run are Poland, Sweden, Switzerland, US, UK, Germany, Czech Republic, China, India, Italy and Japan. All of the graduates we recruit from around the world will start their journey together at IMI’s global headquarters in the UK. Together, you’ll learn what it takes to succeed within IMI and we’ll help you to understand our business strategy and the goals that are driving our growth. As well as excellent support and coaching throughout the two-year programme, we offer a competitive salary, benefits package and international experience that will set you up for a great long-term career. If you can imagine a better world, then you can engineer it with us. We have a big vision: over the next five years we want to double our operating profits. Having such ambitious goals means we’re keen to attract the very best engineering graduates from around the globe to help us. In return, you’ll enjoy the support you need to fulfil your potential, and the opportunity to play a key part in our growth.